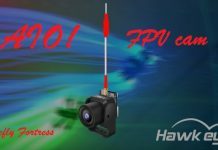 The EWRF e7082VM is a very compact and lightweight AIO camera suitable for small FPV drones. The camera can be powered with 1S LIPO batteries (DC 3~5.2 V). Thanks to the VTX telemetry, you can adjust channels as well as transmission power remotely trough your transmitter. According to your needs, you can toggle the broadcast between 25, 100 and 200mW. 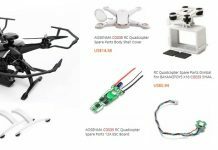 Weighting only 4.4 grams, it can be installed in almost any Tiny Whoop style drone. 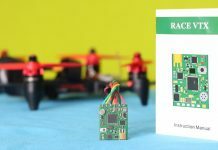 Compatible with 1s LIPO batteries (DC 3~5.2 V input voltage). Compact size (18.03 x 16.83 x 16.55 mm). Finally, press and hold the button to save the settings. In order to enable/disable pit mode, you need to press twice the control button.